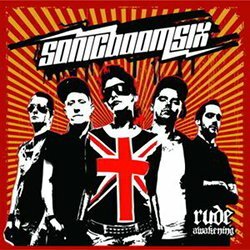 Sonic Boom Six – Rude Awakening CD/LP - Old Punks Never Die! For anyone not yet familiar with this bunch of cheeky Mancs, you could do worse than pick up either (or both) of these juicy releases. Hand-picked by the band, the tracks on show represent the finest fruits of the skapunkdubfunkmetaljungle tree. Tunes have been collected from their earliest works to their most recent offerings, with a particular emphasis on the ones they love to play out on the road (something they do a great deal of), to give a really nicely rounded overview of their energy, range and capabilities. Both versions share tracks, but there are one or two differences too that make owning the pair very appealing. If you have to plump for one, get the CD – there are more songs, an exclusive new version of Puretone’s ‘Addicted To Bass’ and a couple of videos thrown in too. For a tenner a piece they’re a top deal in these recessionary times, and will certainly help keep your revolutionary fervour fiesty.